Steph Su Reads: Friday Featured Blogger (19): Ari from Reading in Color! Friday Featured Blogger (19): Ari from Reading in Color! You may have heard of Ari. She's the fabulous force behind the enlightening blog Reading in Color, which author Justine Larbalestier notes is one of her favorite blogs to read. Ari tirelessly champions why we should read and write more books featuring POC (POC = people of color), and she kickstarted the online campaign to have Bloomsbury change their whitewashed cover of Magic Under Glass. And now I'm going to stop sounding like an introductory speaker and let Ari speak herself! Welcome, Ari, to Steph Su Reads! 1. Tell us about yourself in a few short sentences. For example: name, location, hobbies, activities, pets... and so on! My name is Ari, I'm a sophomore in high school and a proud resident of Chi-town! I'm a former dancer (ballet, jazz and a mix of other types) and I still love to dance. Obviously I love to read, but I don't have any desire to be an author (this seems to surprise people). I started Reading in Color after I discovered that the wonderful world of teen book blogs did not often include reviews about people of color (poc). Where were the reviews of people who looked like me (an Afro-Latina) or who were at least different from the white form? I wanted variety and diversity in books and while I was sure they were out there, I didn't know where to start to find them. I figured starting a book blog would be the best way to get recommendations and as evidenced by my towering tbr pile, I was right :) My blog's birthday falls on the birth day of America, July 4th baby (this was mostly unintentional, I was bored early on in the day and I thought it would be cool to have my blog bday be the same day as my country's bday). Visitors can expect reviews, author interviews, blogger spotlights (just starting out), some giveaways, rants and other random and fun posts (like movie casting for books, participating in memes, etc.) Nothing too different from any other blog. My blog is just special because you will rarely see a book that is not about a poc being reviewed (I do a few called 'off color' reviews, but those usually have important poc secondary characters or the author is a poc who decided to write about a white person). 3. You are stranded on a well-stocked island for 21 days and can choose two celebrities (can be bookish types) and one animal to accompany you. Who would you choose, and why? One of my worst fears (I can't watch Castaway!) but at least it's well-stocked. I would pick T.J. from Whale Talk by Chris Crutcher because I have a crush on him :) He's funny as well as insightful and we could talk about anything. Plus he's an athlete so I could compete against him in sports. I would also choose Ai Ling from Silver Phoenix by Cindy Pon because she's fearless and could help out if we ran into any trouble on the island (T.J. would help too). She loves to eat so I wouldn't have to feel self-conscious if I ate a lot (I don't like eating in front of people) and she could teach me Chinese (preferably Mandarin). I fear getting bored, and I know I would never be bored with either of these people! 4. Name 3 favorite books and why you think everyone should read them. Whale Talk by Chris Crutcher because you will laugh, cry and nod your head in agreement and shake it with disbelief. Gringolandia by Lyn Miller Lachmann because it's about the lasting consequences torture and dictatorships inflict on families. It's not a happy book, but it's hopeful and it provides a fresh perspective on Chile and Pinochet (the dictator the U.s. helped install, *sigh*) and the characters are enjoyable. Marcelo in the Real World by Francisco Stork because the writing, the story and the characters, are absolutely stunning. Because we need more books written about people with disabilities and we need more books where race isn't the main factor, it just is, Marcelo just happens to be Latino, no big deal. Read anything by Francisco Stork. Silver Phoenix by Cindy Pon because Ai Ling is awesome, the scenery is wonderful with vivid details (I want to go to Xia China), it's action packed and filled with wonderful fantasy creatures. 5. What's your favorite thing to do on a Friday/Saturday night? Hang out with my friends, preferably at a basketball game. But I'm usually up for whatever my friends and I feel like doing whether that be roaming Chicago, watching movies or just talking. I try to read on whichever day I don't hang out with my friends (Friday or Saturday it depends), but I actually get most of my reading done during the week in increments (usually the evening while I'm eating). I also like to curl up and catch up on all the shows on my DVR that I miss because of school. 6. Which author's books do you go to when you need something that will make you laugh? Chris Crutcher (I've actually only read one thing by him but it was hilarious), Sherman Alexie (I've only read The Absolutely True Diary of a Part-Time Indian but it was hysterical along with sad), Good Enough by Paula Yoo, The Kayla Chronicles by Sherri Winston and She's So Money by Cherry Cheva. 7. Name 2 things you'd like to do before you die: one fun, one serious. 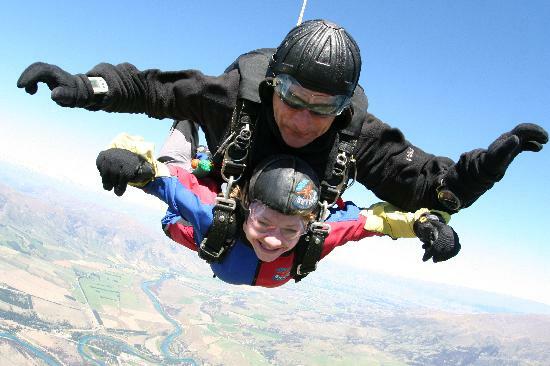 Something no one would expect me to do, but I think it would be really fun: Go skydiving! I hate roller coasters, but it's supposed to feel different from how a roller coaster would. On a more serious note, I think I would like to know what it's like to be in love so I can understand all the hype. 8. Briefly, what are your predictions for the state of POC YA lit over the next few years? I'm mostly optimistic. I think we have seen that with whitewashed covers, more people are stepping forward and loudly proclaiming that they will buy books about POC. Readers are saying that as long as the story is good, it doesn't matter about the cultural background of the characters but it's good to have diversity in books to represent the wide spectrum of readers. So this whole notion that readers won't buy books about POC is silly. My hope is that publishers will take notice of this, see more books about POC being reviewed and start actively seeking submissions by/about POC. 10. And finally, tell us 2 interesting things about yourself that can spark conversation. I cracked my head open when I was 2, thus there is a legitimate reason behind my madness! I did this falling backwards down the stairs and ever since I have had a fear of stairs. What's your fear? Or what have you cracked/broken (I've never actually broken a bone)? Pleasant topic. I get bored easily so I've tried various activities over the years; ice skating, gymnastics, karate (green belt), dance (the only thing I was really serious about and kept at for more than two years), soccer, basketball, track and currently I'm doing field hockey (and I still dance in school hallways). I think I may hold a record by the end of high school for most activities tried and then I move on (I'm not even going to bother listing all the clubs). What's your record and/or what activities do you do? Sorry, I'm not very interesting or talented! Thanks so much for interviewing me Steph! Someone grab an anime mallet and bash the girl the girl over the head. "Not very interesting or talented"? Far from it, Ari! I never get sick of reading anything she writes. So be sure to check out Ari's blog, Reading in Color, if you haven't yet. She writes wonderfully detailed reviews that make me practically drool, I want to read the books so bad. Thanks so much for answering my questions, Ari! Thanks Ari for letting talking with us today. I love diversity in books and lucky for me I live in a very diverse part of town. The richness of all cultures are a wonderful experience. It reminds us just how alike we truly are. It's great to see Ari featured here. She is a seriously awesome and inspiring person, and her attitude to blogging has made me that much more aware that blogging can be more than fun - it can make a difference too. Apparently she's also way too modest. @April-That makes me so happy to hear, your reviews have gotten me super excited to read books (like American Born Chinese, no idea why I still haven't read it). @LM-You are lucky indeed to live in a diverse town. I love how I get to learn about other cultures and ways of doing things through books as well as real life experiences. @Lauren-Ok I'm liking hiding my face in my sleeve with all the praise. I'll work on tooting my own horn a little more =) I'm so glad that I've helped show you that because I firmly believe that, blogging is so much fun but I also like that we can make a difference if we so chose. Read Silver Phoenix! And eat Chinese food while you read it. Thanks again Steph! I will accept a light mallet tap. I like this feature! I've swung by Ari's blog a few times, but I should definitely check it out more! It's an excellent interview. I heard the name of Ari and also read some articles on her but never new this side of her. I also never visited her blog. But after reading your post I am going to read her Blog regularly. I really liked her polite answers. I love Ari and her blog! I always find out about great books from her...things I would never see because of the area I live in. Great interview!